The Helsinki Philharmonic Orchestra's recording of the choral symphony Kullervo by Jean Sibelius is the 2008 winner of the 'Diapason d'or de l'année' in the orchestral music category. The recording also features soprano Soile Isokoski, baritone Tommi Hakala and the YL Male Voice Choir (Helsinki University Choir), under the direction of the orchestra's emeritus chief conductor Leif Segerstam (ODE 1122-5). The awards ceremony took place on November 20 at the Maison de la Radio in Paris. Diapason is France's most widely distributed classical music and HiFi magazine. It teams up with the public radio station France Musique for the 'Diapasons d'or de l'année', which recognise the best classical music recordings of the year. The awarded disc already received a monthly 'Diapason d'or' accolade in the magazine's July/August issue, and critic Christian Merlin praised, "(...) Leif Segerstam's forceful interpretation, at the top of the discography. (...) Soile Isokoski is simply unsurpassable." The Helsinki Philharmonic Orchestra has a long and triumphant association with the music of Jean Sibelius, having premiered under the composer's baton almost all of his symphonic works - including Kullervo in 1892, an event that turned out to be the breakthrough of Sibelius as a truly national composer. This Kullervo recording completes the Orchestra's acclaimed Sibelius symphonies cycle led by Leif Segerstam, which was hailed as "a major Sibelius event" by ClassicsToday.com (ODE 1075-2Q). Since its release in April 2008, the winning disc has continuously received outstanding reviews throughout the international press, including a 'Disc of the Month' accolade at ClassicsToday.com ("the best solo singing the work has ever received"). 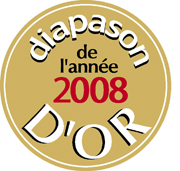 This is already the second time that Ondine won a 'Diapason d'or de l'année'. In 2000, the winner in the same category was Mikko Franck and the Swedish Radio Symphony Orchestra's recording of Sibelius's Lemminkäinen Legends Op. 22, coupled with En Saga Op. 9 (ODE 953-2).